What if the stem cells in our bodies live on, even as we age? What if they are just asleep, quiescent, like forgotten sentinels nodding off at remote outposts, waiting for orders? If only scientists could discover how to send them messages, could they be reawakened? “When you’re little and fall off your bike,” says Cabot professor of the natural sciences Douglas Melton, “you barely remember it the next day and a week later you don’t remember it at all. I ride my bike all the time, and if I fall off now, I remember it for weeks.” Bruises last longer when you get older. But is the slowness of repair due to some deficiency that arises with age, that stops normal processes from working well? Or is it due to the absence of some youthful factor? 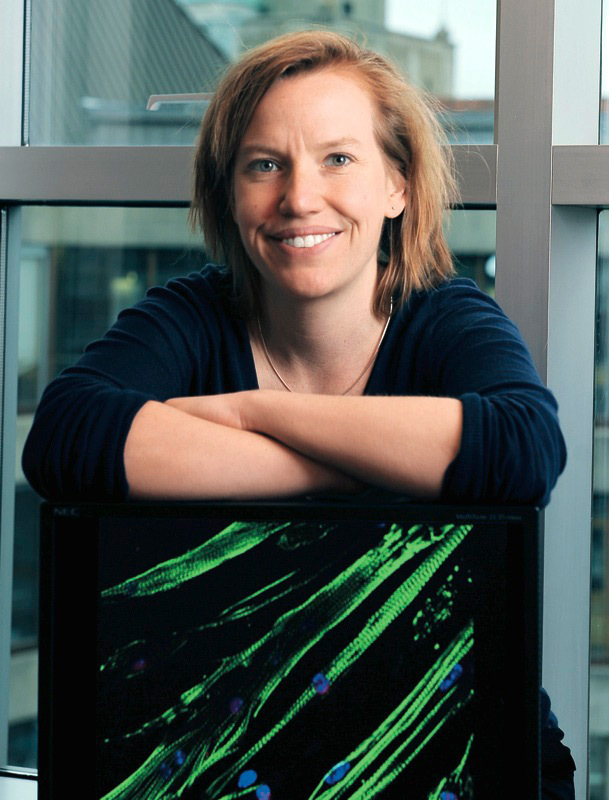 Amy Wagers, an associate professor of stem-cell and regenerative biology, has begun to answer this most provocative of questions—could we marshal the body’s own repair mechanisms to slow the process of aging?—with a simple experiment. Using mice that have been surgically joined so that their bloodstreams become shared, Wagers investigated whether the blood of a young animal might awaken the muscle stem cells in an old one and enhance muscle repair. When Wagers and colleagues joined a young mouse to an old mouse, muscle damage in the young mouse still healed well, suggesting that the older animal did not introduce a defect. When two old mice were joined, as a control, the muscular repair was, as expected, very slow. “You get lots of inflammatory cells coming in, lots of fibrous tissue deposited,” Wagers explains, “and not very much new muscle.” But when a young and an old mouse were joined, and a leg of the old mouse was injured, the healing was rapid: new muscle formed almost as well as in a young animal. Something from the young mouse—an unknown factor circulating in the blood—was reaching muscle stem cells in the old mouse and turning on the biological machinery of repair. Wagers (already a recipient of numerous awards, like many of her junior colleagues in the same field at Harvard) has established that whatever the unknown factor is, it is not a cell. Recently she has discovered a “partial pathway,” previously undescribed in the blood system, that is involved in the process of repair. “The reason we thought the factor that awakens muscle stem cells might be in the blood,” she explains, “is that organ systems decline globally with age, which implies that any signal has to reach many different locations.” A good place to look for a universal signal such as that, she reasoned, is in the blood.